Alright, consider this scenario. We're in Richmond. We didn't get into a car accident. We didn't get cut-off. We got a parking space without incident. We're in a Japanese restaurant. The restaurant is full. Other than the staff, I'm the only Asian person present. Tell me what is the most strange thing that happened? Well, it can probably be all of the above except for being in a Japanese restaurant. 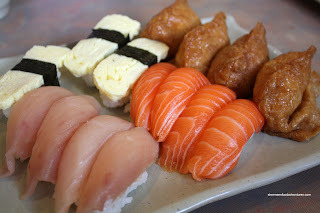 However, it doesn't bode well if I am the only Asian at a Japanese restaurant in Richmond! Despite the repeated warnings from many different people, I have done the unthinkable. 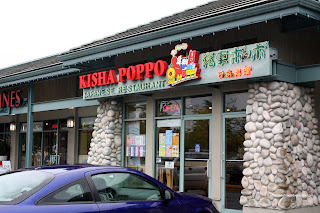 Yah, Kawawa was bad and so was Sui Sha Ya; but Kisha Poppo has often been grouped into that same category of Japanese AYCE that really should be all-you-shouldn't-eat. Now to the rolls... I know, I know, we have a "safe" selection of California Roll, BC Roll, Futomaki, Oshinko and Tekka Maki. Once again, I had to be the closer and finish up the remaining futomaki and BC roll. Apparently, they were too strange compared to the Cali roll. 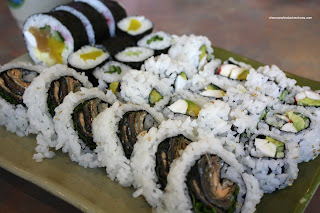 The rolls were pretty standard fast food Japanese fare which really didn't offend (except for the same sub-pa r rice). However, they weren't the most aesthetically pleasing things to look at. They seemed to be rolled haphazardly and probably in advance. 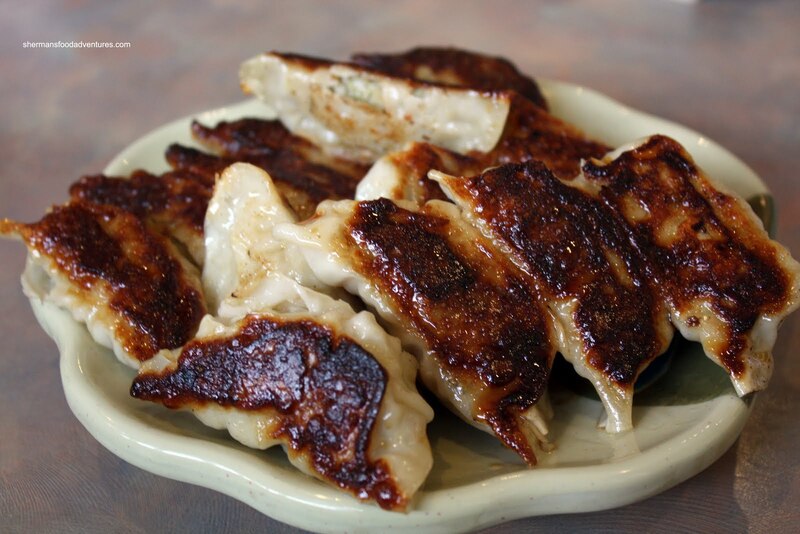 Okay, here we go, one of the most popular items of the meal... Gyozas! I know, for those Japanese food connoisseurs, you are probably rolling your eyes right now; but please bear with me, we had some newbies and they were trying their best. These gyozas were fried up very nicely; however, they were greasier than the floor at Mr. Lube. Furthermore, the filling was loose and really mushy. I didn't like them particularly. It didn't help that we weren't supplied w ith any dipping sauce for them either. Another popular dish was the Chicken Katsu. 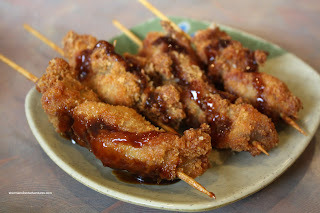 Fried chicken on a stick slathered in sauce. Not particularly the one thing we'd identify with Japanese food. Whatever, looking past that, they were actually quite good. Fried up crispy with moist chicken, we tried to order more. But every time, we got like one instead of the 4 we ordered. Honestly, I'm not sure how they messed this up really. I know since it's AYCE, you can keep ordering it until you get the requested amount; but if that takes a total of an hour, then what's the point? Moving on... Something that I thought would be popular really didn't materialize. 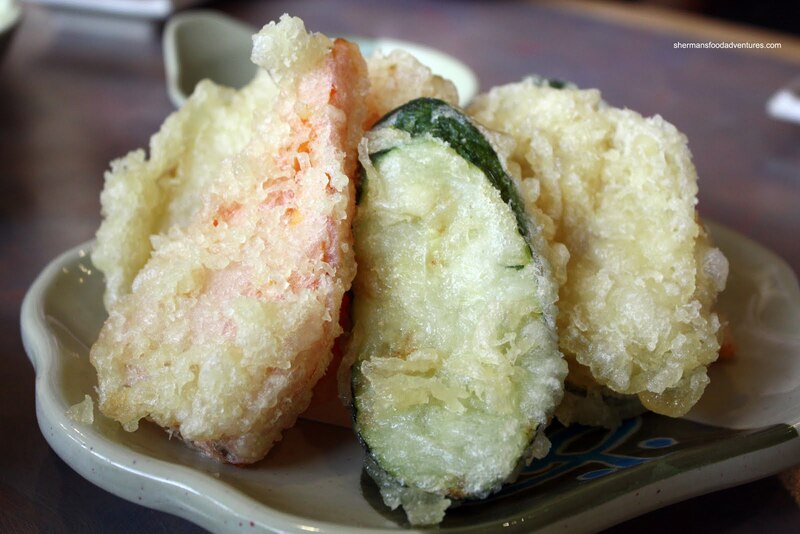 No one seemed interested in the Tempura. Yah, they weren't missing much anyways. It was quite greasy with a bit too much batter. In fact, the veggies inside were just plain slimy. I really didn't enjoy eating this. 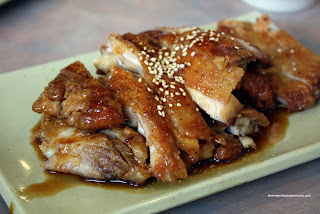 One dish that got a lot of play was predictably the venerable Teriyaki Chicken. Of course it did since you'll find it in most bento boxes. I must admit that this one was quite good. The chicken was fried up crispy while still being moist and tender. A s you can see, it is not slathered in an obscene amount of teriyaki sauce either. Universally, this dish was well-liked and we had to order more. In addition to the aforementioned items, we got most of the other lunchtime AYCE offerings and honestly, they were okay. Despite the fact that Kisha Poppo is not somewhere I'd personally eat at again, it is an option for those looking for Westernize Japanese food. I say this only because there are worse places such as Sui Sha Ya and Kawawa. But again, if you really must do AYCE Japanese, go to Ninkazu or Tomokazu. I work near this complex and unfortunately end up eating here on the rare occasion due to the lack of sushi restaurants in the area. I would suggest you try Maruwa which is in the same complex, located beside the Tim Hortons. 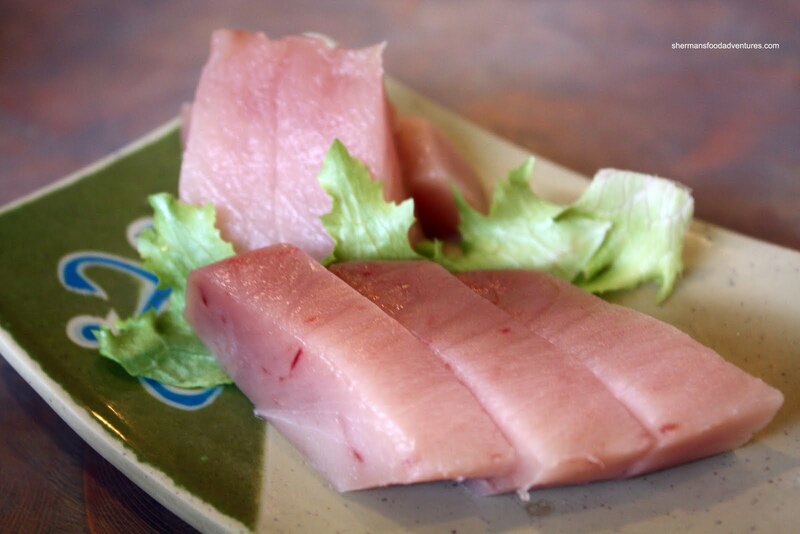 I believe it is Japanese owned and operated, and their quality is quite good. It is not AYCE, but worth the visit.